A lot can go wrong during a move. Furniture can get damaged, and small items can get broken, but one of the biggest concerns is electronic equipment. Whether you’re moving a few TVs, computers, and gaming systems in a residential move, or your business is preparing to move dozens of computers, it’s important to know exactly how to pack everything properly. Before you even start thinking about unplugging computers and placing them into boxes, you should take the necessary steps to back up important files. That includes important business information, but it also includes personal information, like bookmarks and temporary files saved on the desktop. No matter how careful you are with the following steps, you can’t completely prevent an accident. Backing up all your important files will ensure if there is an accident, you don’t lose important information. Taking electronics apart is easy. Putting them back together isn’t so easy, especially if you’re dealing with multiple cords, monitors, and more. Make things easier on yourself when it’s time to reassemble electronic equipment by labeling every part before you put it in a box. That might mean color-coding cables and taking pictures to see exactly how everything goes together. That way, you aren’t wasting time trying to figure out which cable gets plugged in where. Not only do you have to think about where to plug in the right cables, you also need to know which cables go with which electronic devices. Make sure that isn’t a problem by packing the electronics in the same box with all their accessories. For computers, that definitely means packing the monitor with the tower and corresponding cables, but other electronic equipment should be kept with its accessories too. For example, the ink cartridge should be removed from the printer, but it should be kept with the printer and its cords. Choosing the right packing materials is important, but it is especially important when figuring out how to pack electronics. Not only do you want to prevent your sensitive electronics from breaking during transport, you also must be mindful of other problems that can arise. All equipment should be placed in three-ply cardboard boxes to prevent damage, should the boxes slide around or get dropped. You should also use anti-static packing materials. 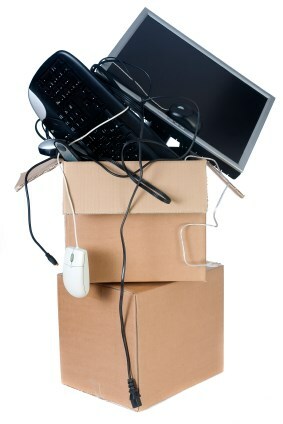 Internal computer parts are susceptible to static electricity, so using paper is a better option than bubble wrap. Are you worried that you might not be packing your electronics properly? Ask Fallon Moving & Storage. Our CT movers can provide you with advice, and we can provide you with packing and transport services that will keep your electronics in tip-top condition until they arrive at your destination.